The elderberry plant is a large deciduous shrub found throughout most of North America. Though now often found growing as a weed, in the past the plant was prized for its tiny, purple berries, which have a distinct, tart flavor and can be used in making jellies, jams and wine. Knowing the characteristics of elderberry can prevent misidentifying another plant, water hemlock, which is very similar in appearance to elderberry and can be easily confused for it, but is highly toxic. Elderberries inhabit the entire United States, including Alaska, and all but the most northern parts of Canada. They inhabit bottom land and areas near lakes, swamps, canals, and woodland settings and are frequently seen along, tree lines, trails and roadsides. Elderberry plants prefer moist, fertile soils, but can grow in a range of soil conditions. 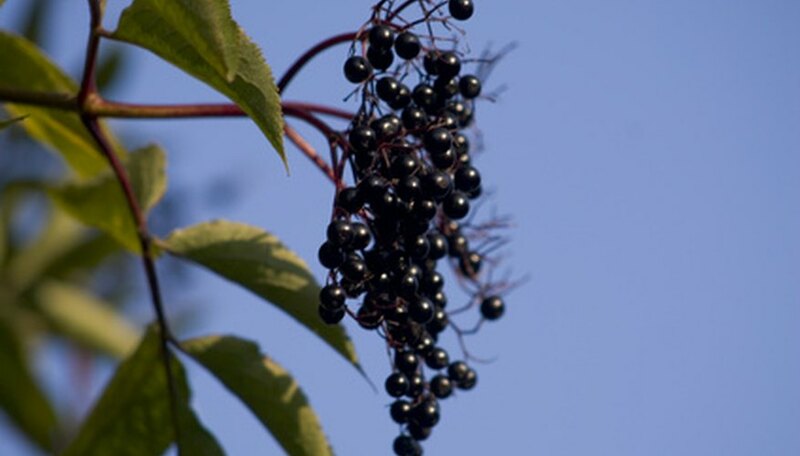 Elderberry grows as a large shrub or a small tree and can reach a height of 12 to 20 feet tall. The stems are woody with a white to light gray pith. This can be used to identify it from water hemlock, which has hollow piths. The bark of the plant is grayish brown, smooth and thin. As the plant matures the bark will become rough. The leaves of the elderberry plant are compound, with multiple leaflets on each leaf. They are arranged opposite each other along a central stem. This differentiates them from water hemlock, where the leaflets alternate down the stem. Each leaf is 5 to 10 inches long, with as many as 11 leaflets. Each leaflet is 2 to 6 inches in length and 2 inches in width. The leaves are lance-shaped with serrated edges. The upper surface is usually dark green and smooth and the underside is lighter green. The flower heads of elderberry form in large flat-topped and umbrella-like sprays of tiny white flowers that occur at the end of each stem. Each flower head can be 6 to 12 inches across. The flowers are slightly fragrant. The elderberry fruit is actually quite small, usually no more than 1/4 inch in diameter. It is purple-black in color, juicy and fleshy. The taste is tart and slightly sweet. The fruit appears in large clusters that form from the flower heads and often droop at the end of the stem to which it is attached. Berries appear in late summer and early fall.